Why do people welcome dogs into their homes? As you might imagine, I already have my answer to this question, but it’s worth asking out loud anyway. God bless my St. John’s family in Oniontown for asking me to bring Sherlock for a visit–and bless friend Bill for the license plate. 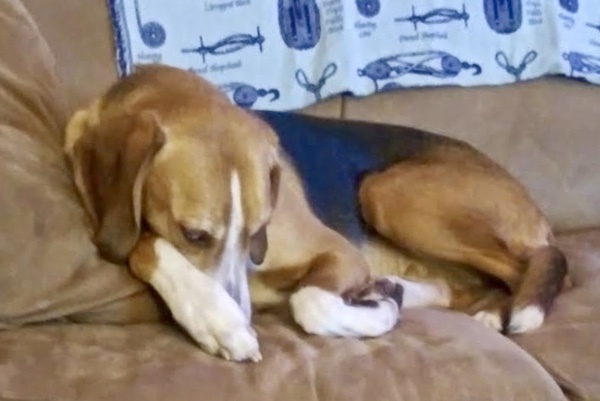 In fact, I knew well in advance why the Coleman family adopted Sherlock Holmes, a three-year-old foxhound, on December 17, 2018. Not for an instant have wife Kathy and I regretted our decision, but as the honeymoon period of sharing 900 square feet with this hooping, nose-to-earth sleuth wanes, the consequences of rescuing a stray snap into focus. Today’s tame reckoning takes me back to 1988, the year daughter Elena was born. “Everything is an ordeal,” I groaned. “We can’t even run to the store without holding a strategy session.” Pros and cons had to be listed. The toil of wrestling a surprisingly strong, howling infant into a car seat had to be weighed against other exertions scheduled for the day. Daily life, though joyful, was also a snarling pack of unintended consequences. There was no end to what needed to be reconsidered in the light of parenting a fresh baby. Dear old Watson–may God rest him–went on to glory before his partner Sherlock Holmes arrived. Three decades later, adapting to Sherlock Holmes is child’s play by comparison. His food-in to food-out ratio is owner-friendly, thank goodness. 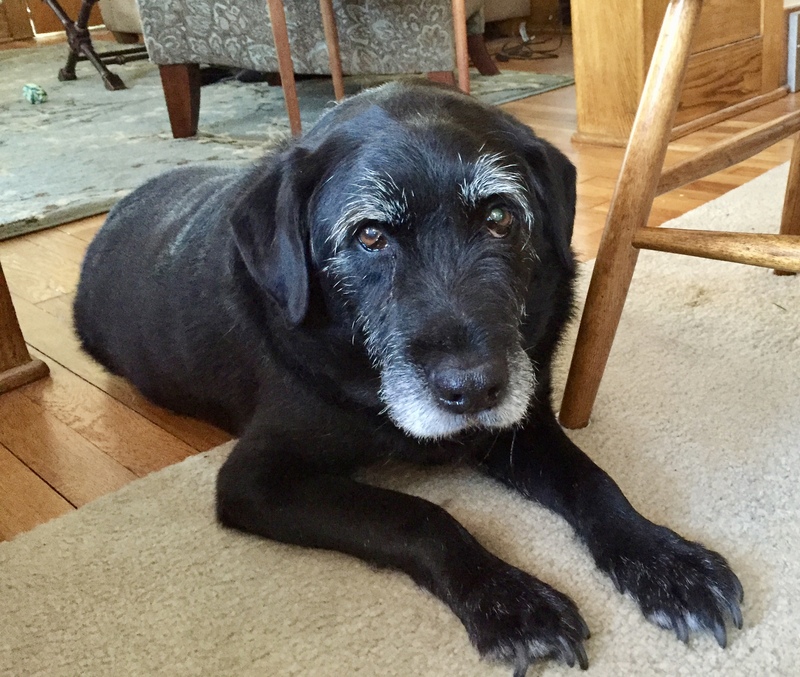 I’ve lived with German shepherd Dutch and black-lab mix Watson before, so I know what it’s like to wander about with a shovel and hold my gag reflex at bay. The bigger aesthetic issue is mud, which Mr. Holmes generates with a Midas touch. The chap is all leg and paw. At a sprint on level terrain, he appears to be careening down a steep hill. Bone, lean muscle and fur swing in all directions. Yard slurry flies like in a macho truck commercial. No worries, though, as a rag by the backdoor and grass seed come spring will put matters right. Even Sherlock’s scavenging for treats can be managed with a toddler’s gate across the kitchen doorway, which has so far fooled him into doubting his steeplechase skills. Good thing, for no corner of the countertops is out of his reach. The other night Kathy spent three hours baking healthy treats for “Holmes”—her preferred handle—but left two cookie sheets of them unguarded. He consumed 2/3 of the batch, which means he’ll be lively and regular for days to come. At the shelter our new family member was called Ollie, but the name didn’t stick. Mr. Holmes’ need for stimulation and activity has certainly been an adjustment, but since this benefits our sedentary family, we can only thank him for three-mile walks and bracing excursions to the dog park. In fact, our gratitude for this overgrown beagle has more to do with spiritual than physical wellbeing. I figured this would be the case. No newsflash here. Dog owners share an understanding that living with animals taps into a deep reservoir of human emotion. If you own a computer, check out “puppy surprise” videos on YouTube. Just have Kleenex nearby. Thousands like me watch as a golden retriever or pug or dachshund gets handed to an unsuspecting person of any age or gender. First there’s a gasp, then a squeal, scream or “aw,” and, of course, tears. Kisses on the snout follow, along with blissed out petting and hugging. Some folks go to pieces, rocking from side to side with their foreheads resting on the floor. 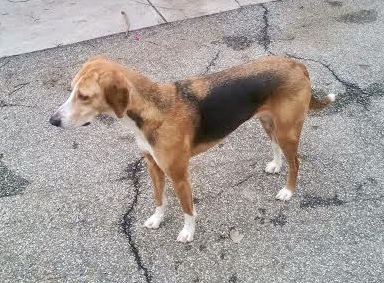 I myself have never cried over adopting a dog, but I’ve been undone by saying goodbye and know exactly why this Oniontown pastor bothered to take in a frightened, confused stray. When I get home later, I’ll sit on the couch and pull his face toward mine, breathe in the earthy smell of dog and run my face over his head for as long as he’ll stay still. If you’ve ever done something like this with your dog—or cat or whatever—you know that time stops as you take in draughts of blessing. The end of the honeymoon–Sherlock had to be corrected for being a little too touchy about his food and intolerant of family cat, Baby Crash. You’ll never hear me put “just” before “a dog.” The sweet nothings we whisper in our foundling’s ear can never compensate him enough for what he gives. And what he gives is an invitation to love, especially when nothing else can draw us outside of our personal cages or stop us from chewing the cud of sad memories. You and I were born to love. Every word or action suggesting otherwise is a bad translation of what we were created to be. Thank you, thank you, thank you, John. Your Foxhound doggie doc., and the wonderfully restrained and warm responses of Alexandria Ocasio-Cortez in her battle with troll detractors, make for delightful New Year’s reads. We need this for 2019 – good news, good use of language, morally upbuilding thoughts. Again, thank you. John: I hope you and Holmes have a long and happy partnership solving the mysteries of God’s plan. This is beautiful and also hilarious at parts so that I laughed out loud. Your description of Holmes running is wonderful!